Tutti Gourmet's "Bites" are a snackers dream come true. Sweetened only with bananas, these Bites are vegan, kosher, gluten, wheat, dairy, soy, corn free with no added sugar or salt. Handmade and carefully dried in small batches to a fine and delicate crisp, this Snack is the ultimate nutrient dense companion for all ages. 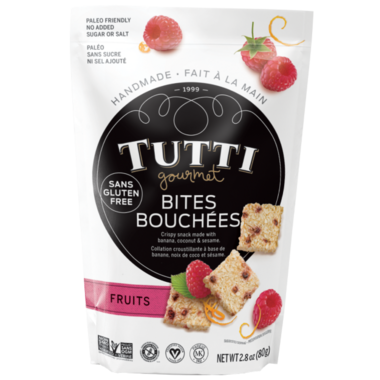 Tutti Gourmet Bites come in 4 amazing flavours and they are loaded with the health benefits that come from bananas, organic coconut and organic sesame. Ingredients: BANANA PUREE, ORGANIC COCONUT, ORGANIC SESAME SEEDS, RASPBERRY, ORANGE AND LEMON RIND. I did not enjoy these. These Tutti Bites are amazing! Such a great flavourful snack between meals. The taste is lovely - just sweet enough and the crunchy texture is very satisfying. I love to keep a package in my drawer at work and take them out mid-afternoon for a little treat. Very addictive! I wish these weren't as expensive, but they're so good, i'd definitely buy them again. Enjoy these as a light snack. 2 of these satisfies me. A bit too sweet tasting for me. These ones are my favourite flavour and I could easily eat a whole bag in one sitting if I wasn't careful. LOVE these! a bit pricey on well though. | ate all of these in one sitting! I really enjoyed the combination of crunch and sweetness. I recommend these to anyone on an elimination diet or with allergies. Really good. Can't wait to try the other flavours! I have been on a low Fodmap diet since August and these snacks literally saved me as they were the only snack that had natural and minimal ingredients. To top it off they are crunchy & delicious!!! Love these. They are my go to snack. These are very tasty! A great snack! I loved these and actually went and ordered the Banana Crisps Cacao (those are OK but the Fruit ones are much better) . They are light, very crispy and not too sweet. Will order more for sure. Like these as a light snack. I like these crisps. They are really thin and crunchy and have a nice banana flavor (more like real banana flavor and not artificial flavor). Not what I expected at all. Not much taste when it tastes like cardboard. Also very little in the package! these tiny treats are deeeelicious!